Make a Killing on the Coming Energy "Debt Bubble"
Subject: Make a Killing on the Coming Energy "Debt Bubble"
The recent rise in prices would seem to be just what the smaller operators in the United States need to avoid a sector meltdown. Make no mistake: There will be fewer oil producers in the United States at the end of the year than there were at the beginning – even if the overall pricing trajectory remains pointed up. This week, a bout with rising bond yields has once again put pressure on the Achilles' heel of most small operators. Most American exportation and production (E&P) companies have been cash poor over the past decade, regardless of the price of oil. Especially if the company is publicly traded. In a higher (and stable) oil pricing situation, cash proceeds translated into a higher offered dividend constitute a better return for the company's share value than a rapid retirement of debt. Energy debt is found at the upper end of the high-yield debt curve. That is often referred to as "junk bond territory" – issuances below investment grade. Since this debt has a higher risk of default, it provides a lower face value and a higher interest rate. That is simply a risk premium – the issuing company realizes lower funding and has to pay more to receive it. To stay afloat, leveraged oil companies need to be able to roll existing debt over and access debt markets for additional funding. Unfortunately, as oil prices retreated some 60% between August 2014 and February 2015, the yield curve exploded. 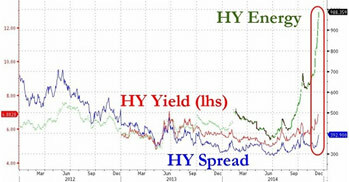 As junk bond yield rates increased, energy yields expanded even quicker, as shown in this chart of high-yield (HY) energy spreads. 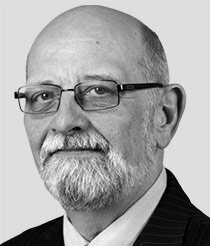 My estimates as of close of trade on Tuesday are indicating a significant bubble forming in indebted oil companies' abilities to weather the debt storm. Each 1-basis-point rise in investment grade debt yield has translated into a (quite generalized) rise of almost 2 basis points in junk bonds. Of course, much of this is a function of a massive re-pricing in global debt, with at least some of it due to the market deciding (not always for the best of reasons) to do the Fed's job for them. The continuing acceleration in debt yields, therefore, is not likely to continue at such a pace for much longer. Some say oil will go to $10, others say $200. What makes this analysis more probable? What companies are most vulnerable over the remainder of the year? From your column, "Make a Killing On the Coming Energy "Debt Bubble" your analysis is great, but do you have any opinion on the possible m&a's?